We live in a continuously changing business environment, which moves ever-closer to a more-connected digital world. Successful organizations need to be proactive and adjust quickly. Therefore an increasing number of organizations establish a Business Process Management Discipline (BPM-Discipline™) in order to move their strategy into execution at pace with certainty. As any other management discipline, the BPM-Discipline is established through the appropriate business process, the process of process management. This new process is led through an emerging top management role, the Chief Process Officer (CPO). The CPO manages the process of process management in a way that it creates value by executing the business strategy across organizational boundaries, like departments or divisions. 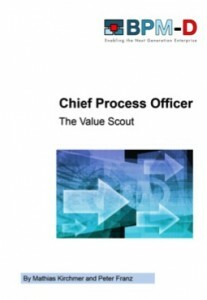 The CPO is the “value scout” of the organisation. Many thanks for your interest in the BPM-D® Paper. Please fill in your details below and we will email the document to you immediately.